RVARC staff and volunteers learned about the Public Right-of-Way Accessibility Guidelines (PROWAG) during a workshop from the University of Virginia Transportation Technical Academy. PROWAG ensure that all people can navigate safely on foot in the public right-of-way. Rachel Ruhlen felt the training would enhance the bike/walk/disability audits that the Regional Bicycle & Pedestrian Advisory Committee has been doing with locality staff. During these audits, locality staff are always impressed watching Garrett Brumfield, a committee member, or Tiffany Lee, a volunteer, navigate the sidewalk and streets in their wheelchairs, or blind volunteers find their way around using sound and touch. The audits often turn up simple repairs that can make a big difference to a person with vision or mobility impairment. 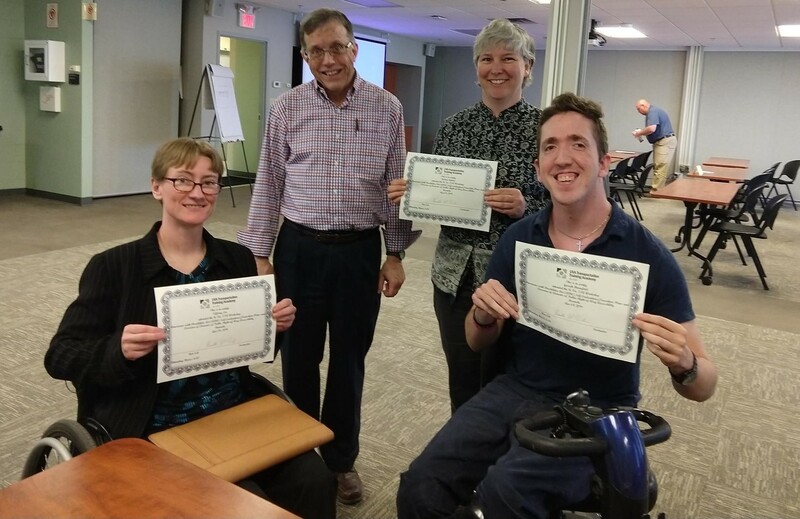 RVARC sent Rachel, Garrett, and Tiffany to the workshop to learn PROWAG, the best practices for accessibility, developed by the US Department of Justice Access Board. This entry was posted in Transportation on April 5, 2019 by Rachel Ruhlen.